The Harvard Art Museums are part of Harvard University and comprise three museums: the Fogg Museum (established in 1895), the Busch-Reisinger Museum (established in 1903), and the Arthur M. Sackler Museum (established in 1985) and four research centers: the Archaeological Exploration of Sardis (founded in 1958), the Center for the Technical Study of Modern Art (founded in 2002), the Harvard Art Museums Archives, and the Straus Center for Conservation and Technical Studies (founded in 1928). 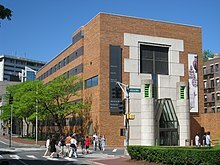 The three museums that constitute the Harvard Art Museums were initially integrated into a single institution under the name Harvard University Art Museums in 1983. The word "University" was dropped from the institutional name in 2008. The collections include approximately 250,000 objects in all media, ranging in date from antiquity to the present and originating in Europe, North America, North Africa, the Middle East, South Asia, East Asia, and Southeast Asia. The renovated building at 32 Quincy Street unites the three museums in a single state-of-the-art facility designed by architect Renzo Piano, which increases gallery space by 40% and adds a glass, pyramidal roof. In a view of the front facade, the glass roof and other expansions are mostly concealed, largely preserving the original appearance of the building. The Fogg Museum is renowned for its holdings of Western paintings, sculpture, decorative arts, photographs, prints, and drawings from the Middle Ages to the present. Particular strengths include Italian Renaissance, British Pre-Raphaelite, and French art of the 19th century, as well as 19th- and 20th-century American paintings and drawings. The museum's Maurice Wertheim Collection is a notable group of impressionist and post-impressionist works that contains many famous masterpieces, including paintings and sculptures by Paul Cézanne, Edgar Degas, Édouard Manet, Henri Matisse, Pablo Picasso, and Vincent van Gogh. Central to the Fogg's holdings is the Grenville L. Winthrop Collection, with more than 4,000 works of art. Bequeathed to Harvard in 1943, the collection continues to play a pivotal role in shaping the legacy of the Harvard Art Museums, serving as a foundation for teaching, research, and professional training programs. It includes important 19th-century paintings, sculpture, and drawings by William Blake, Edward Burne-Jones, Jacques-Louis David, Honoré Daumier, Winslow Homer, Jean Auguste Dominique Ingres, Alfred Barye, Pierre-Auguste Renoir, Auguste Rodin, John Singer Sargent, Henri de Toulouse-Lautrec, and James Abbott McNeill Whistler. The art museum has Late Medieval Italian paintings by the Master of Offida, Master of Camerino, Bernardo Daddi, Simone Martini, Luca di Tomme, Pietro Lorenzetti, Ambrogio Lorenzetti, Master of Orcanesque Misercordia, Master of Saints Cosmas and Damiançand Bartolomeo Bulgarini. Flemish Renaissance paintings — Master of Catholic Kings, Jan Provoost, Master of Holy Blood, Aelbert Bouts, and Master of Saint Ursula. Italian Renaissance period paintings — Fra Angelico, Sandro Botticelli, Domenico Ghirlandaio, Gherardo Starnina, Cosme Tura, Giovanni di Paolo, and Lorenzo Lotto. French Baroque period paintings — Nicolas Poussin, Jacques Stella, Nicolas Regnier, and Philippe de Champaigne. Dutch Master paintings — Rembrandt, Emanuel de Witte, Jan Steen, Willem Van de Velde, Jacob Van Ruisdael, Salomon van Ruysdael, Jan van der Heyden, and Dirck Hals. American paintings — Gilbert Stuart, Charles Willson Peale, Robert Feke, Sanford Gifford, James McNeil Whistler, John Singer Sargent, Thomas Eakins, Man Ray, Ben Shahn, Jacob Lawrence, Lewis Rubenstein, Robert Sloan, Phillip Guston, Jackson Pollock, Kerry James Marshall, and Clyfford Still. Founded in 1901 as the Germanic Museum, the Busch–Reisinger Museum is the only museum in North America dedicated to the study of art from the German-speaking countries of Central and Northern Europe in all media and in all periods. William James spoke at its dedication. Its holdings include significant works of Austrian Secession art, German expressionism, 1920s abstraction, and material related to the Bauhaus design school. Other strengths include late medieval sculpture and 18th-century art. The museum also holds noteworthy postwar and contemporary art from German-speaking Europe, including works by Georg Baselitz, Anselm Kiefer, Gerhard Richter, and one of the world's most comprehensive collections of works by Joseph Beuys. The Busch-Reisinger Art Museum has oil paintings by artists Lovis Corinth, Max Liebermann, Gustav Klimt, Edvard Munch, Paula Modersohn-Becker, Max Ernst, Ernst Ludwig Kirchner, Franz Marc, Karl Schmidt-Rotluff, Emil Nolde, Erich Heckel, Heinrich Hoerle, Georg Baselitz, László Moholy-Nagy, and Max Beckmann. It has sculpture by Alfred Barye, Kathe Kollwitz, George Minne, and Ernst Barlach. From 1921 to 1991, the Busch-Reisinger was located in Adolphus Busch Hall at 29 Kirkland Street. The Hall continues to house the Busch-Reisinger's founding collection of medieval plaster casts and an exhibition on the history of the Busch–Reisinger Museum; it also hosts concerts on its Flentrop pipe organ. In 1991, the Busch-Reisinger moved to the new Werner Otto Hall, designed by Gwathmey Siegel & Associates, at 32 Quincy Street. In 2018, Busch-Reisinger featured "Inventur–Art in Germany, 1943–55", which was named after a 1945 poem by Günter Eich. The Arthur M. Sackler Museum opened in 1985. The museum building, which was designed by British architect James Stirling, was named for the major donor, Arthur M. Sackler, a psychiatrist, entrepreneur, and philanthropist. The museum also housed offices for the History of Art and Architecture faculty, as well as the Digital Images and Slides Collection of the Fine Arts Library. As of 2016[update], the old Sackler Museum building houses the History of Art and Architecture Department and the Media Slide Library. After completion, the building's coverage was even greater, with general acknowledgment of the building's significance as a Stirling design and a Harvard undertaking. Aside from descriptions of the building's organization and exterior appearance, perhaps most noted was the way in which the inventive design accommodated its diverse program on a challenging site. Harvard published a 50-page book on the Sackler, with extensive color photos by Timothy Hursley, an interview with Stirling by Michael Dennis, a tribute to Arthur M. Sackler, and essays by Slive, Coolidge and Rosenfield. As of 2013[update], the future use of the building was unclear, as its collection has been relocated to the Renzo Piano extension to the Fogg. Stirling's structure still stands as of December 2016[update]. Since 1984, the building has housed the University's department of the History of Art + Architecture, with building renovations being completed in early 2019 to better accommodate the faculty and students. ^ a b c "History". Harvard Art Museums. Archived from the original on 2013-06-18. Retrieved 2013-07-20. ^ "Archaeological Exploration of Sardis". Harvard Art Museums. Retrieved 2013-07-20. ^ "Center for the Technical Study of Modern Art". Harvard Art Museums. Retrieved 2013-07-20. ^ "Straus Center for Conservation and Technical Studies". Harvard Art Museums. 2008-02-18. Retrieved 2013-07-20. ^ "After 6 years, Harvard Art Museums reemerging". Boston Globe. 12 April 2014. Retrieved 6 October 2016. ^ "Renzo Piano reconfigures Harvard Art Museums around a grand courtyard atrium". Dezeen magazine. Retrieved 19 November 2014. ^ Farago, Jason (15 November 2014). "Renzo Piano reboot of Harvard art museums largely triumphs". The Guardian. ^ Harvard News Office (2002-04-04). "Harvard Gazette: Color, form, action and teaching". News.harvard.edu. Retrieved 2013-07-18. The first Fogg Museum, known as Hunt Hall, was built in 1893 and demolished in 1974 to make way for Canaday. The "new" Fogg was built in 1925 where the home of Harvard naturalist Louis Agassiz once stood — the original Agassiz neighborhood. The building is named for William Hayes Fogg, a Maine merchant who was born in 1817, left school at 14, and grew rich in the China trade. After he died in 1884, his widow, Elizabeth, left $200,000 and the couple's Asian art collection to Harvard. ^ "The Virgin and Child Enthroned; Christ on the Cross between the Virgin and Saint John the Evangelist". Harvard Art Museums. Retrieved 29 July 2016. ^ "The Virgin and Child Enthroned". Harvard Art Museums. Retrieved 29 July 2016. ^ a b c "History and the Three Museums". Harvard Art Museums. Retrieved 29 July 2016. ^ The Dedication of the Germanic Museum of Harvard University. Harvard University. Germanic Museum. German American Press. 1904. ^ Scharmann, Allison (February 12, 2018). "Inventur: Forgotten Art Rediscovered at the Harvard Art Museums". The Harvard Crimson. Retrieved February 20, 2018. ^ Lenger, John. "Busch-Reisinger marks a century". The Harvard Gazette. Retrieved 4 November 2015. ^ "Busch-Reisinger's Kuhn to Retire After 38 Years as Museum Head". The Harvard Crimson. March 26, 1968. Retrieved 4 November 2015. ^ "Staff and Contact". Harvard Art Museums. Retrieved 29 July 2016. ^ Glueck, Grace (October 18, 1985). "Sackler Art Museum to open at Harvard". The New York Times. Retrieved July 30, 2016. ^ "Arthur M Sackler Museum". Time Out North America. Retrieved July 30, 2012. ^ a b Stapen, Nancy (October 28, 1985). "Harvard's startling Sackler. Challenge was to fit museum into `architectural zoo' - CSMonitor.com". Csmonitor.com. Retrieved July 30, 2016. ^ Cannon-Brookes, Peter (September 1982). "James Stirling's design to expand the Fogg Museum". International Journal of Museum Management and Curatorship. 1 (3): 237–242. doi:10.1016/0260-4779(82)90056-5. Retrieved 31 July 2016. ^ Jennifer A. Kingson (October 22, 1984). "Warehouse or Museum?". Thecrimson.com. Retrieved July 30, 2016. ^ Peretz, Martin (29 June 2008). "A List Of Buildings To Demolish In Cambridge, Massachusetts". New Republic. Retrieved 2016-12-09. ^ MacGregor, Brianna D. (September 26, 2013). "Sackler Building Faces Uncertain Future | News | The Harvard Crimson". www.thecrimson.com. Retrieved 2016-12-09. ^ "About". haa.fas.harvard.edu. April 18, 2019. Wikimedia Commons has media related to Harvard Art Museums. Wikimedia Commons has media related to Fogg Art Museum. This page was last edited on 19 April 2019, at 16:28 (UTC).